If you feel that you are primarily a visual leaner, it is important that you begin to employ visual learning techniques. Get to grips with colour-coding, diagramming and poster making and you are sure to find that you feel more connected with your studies and that you are able to retain more information and ideas, for longer periods of time. Taking comprehensive notes is an important visual learning technique. 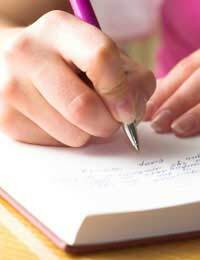 If you find listening to lectures or long speeches difficult, ensure that you always have a pen and paper to hand. Write down key words and ideas that you hear and look back over these after the lesson to help you process the information in the best way for you. You might find it useful to present your notes in a clear and imaginative manner; use different fonts, spacing and underlining. Write sub headings in capital letters and make use of a variety of colours. You might like to sketch quick pictures and diagrams too. Whilst a lecture-style lesson might not be ideal for you, make the most of it by calling upon these tips in order to bring the information in line with your preferred style of learning. If you are trying to remember how to spell a word that you have heard but are experiencing difficulty, try to picture the combination of letters in your mind. Similarly, if a teacher is explaining an idea or concept to you through speech, take a few words and turn them into images in your mind. You might also like to imagine the words as they would be written. Making things visual will help you to boost your memory and improve your understanding. At every available opportunity, take the time to process information in your own way. This might involve making a unique poster in order to illustrate a concept, or designing your own diagram in order to help you to make sense of a scientific process. Use spider diagrams to show the links between ideas. You might like to engineer your own colour-coding system to enable you to see the relationships between different sets of information within a subject. Plot graphs, draw pictures and make handy pocket-sized flash cards. Finally, as a visual leaner, you may be easily distracted by mess and a lack of order. Ensure that your desk is tidy and that everything is in its proper place. Keep clutter to a minimum to minimise distractions. Being a visual learner can be hugely enjoyable as it offers you the opportunity to be creative and to incorporate art and design into all your subject areas. However, it does require you to go the extra mile and take the time, perhaps even out of class, to ensure that you have understood all that you have learnt and presented it in a manner that works for you. Having the necessary tools to hand will make a real difference. Invest in pens, coloured pencils, large sheets of paper, highlighters and a ruler to ensure that you are never caught short in class.